The User-Friendliest Line Array System Yet? The QSC KLA12 active line array speaker system makes it as easy as possible for you to bring mighty sound reinforcement to big indoor and outdoor spaces. These KLA active speakers are the answer, in applications where traditional PA powered speakers are no longer sufficient to move the necessary air and volume. In the KLA12, QSC gives you a modular line array speaker with a "Click and Play" design. KLA12s can be coupled easily to form arcuate line arrays -- connect as many boxes as you need. With just five of these boxes, you can get complete 90-degree vertical coverage to send sound evenly across a big audience. 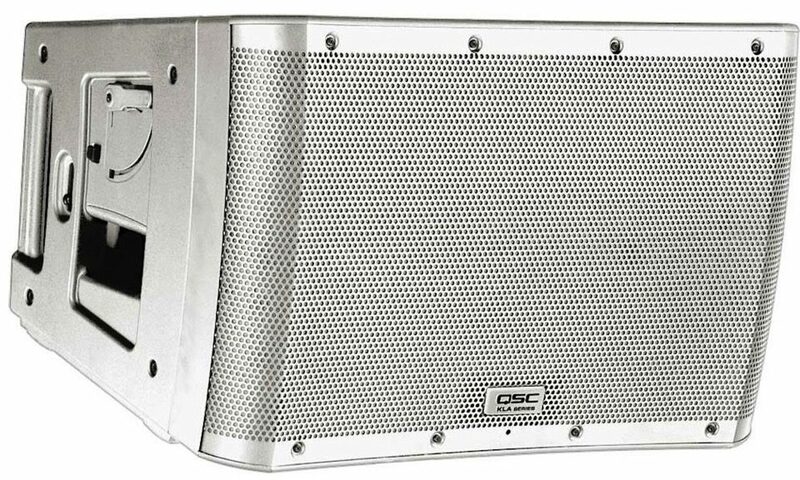 QSC KLA12 speakers are ideal in situations ranging from parks, to large halls, to houses of worship. Each speaker module itself is a two-way design setup with a 12-inch low-frequency transducer and a 1.75-inch compression driver. Each KLA12 employs a super-efficient 2 x 500-watt power amp, which allows you to combine up to link up to five KLA12s and/or KLA181s (QSC's complementary 18-inch KLA subwoofer) and drive the whole array off a single 15 amp, 120 volt electrical circuit. 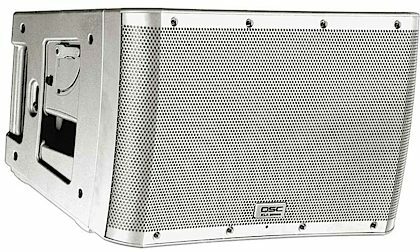 The QSC KLA speakers were designed to be so easy to assemble, that you can even put an array together alone if you need to. Operators are aided in their task with the unique self-contained SOLO Rigging System that allows you to quickly assemble and disassemble a complete rig without the need for any special tools or hardware. The KLA12s offer you a number of other features that make them so exceptionally friendly to use. The Ar-Q Arcuate Equalization processor onboard lets you perform line array tuning that compensates various dimensions of the tonal curve depending on the number of boxes in the array. Select the DEEP mode (Digital Extension and Excursion Processing), and QSC's DSP algorithm provides noticeably extended bass response, while actively protecting your speakers from damaging low-frequency transients. You can also select a Flat mode, or set your KLA12s to run with external subwoofers. QSC's proprietary Intrinsic Correction runs in the background -- performing active adjustments to time, frequency and amplitude response to achieve the flattest possible bandpass target. GuardRail circuitry protection keeps the amplifier safe from any damaging distortion. When you start to daisy-chain multiple KLA Series loudspeakers together, you'll use the single remote pot wired to the on-board Phoenix-style connector on the rear panel. Additional I/O includes a balanced, line-level XLR input in parallel with an XLR Thru connector, PowerCon In and Thru connectors, and Attenuation Control. Easily visible LED indicators let you monitor Signal, Limit, Power and Standby status. The QSC KLA12 is a SOLO Rigging System Housed in a rugged ABS enclosure that results in both light weight and long-term durability, the KLA12 features a 12-inch low frequency transducer coupled with a 1.75-inch compression driver. Designed to be used exclusively as a fixed arcuate line array, each KLA12 is set at a 90* horizontal by 18* vertical splay angle, allowing 90* vertical coverage arrays to be configured using only five boxes (most other solutions require six). KLA's unique self-contained SOLO(tm) (Single-Operator Logistics) Rigging System enables users to quickly assemble (and disassemble) the line array in a fraction of the time without the need for special tools or external hardware. The KLA12 Ar-Q(tm) (Arcuate Equalization) processing enables users to quickly tune the array, making appropriate frequency compensation adjustments based on the number of boxes. With the click of a dial, the user can select the total number of boxes deployed in the array resulting in an evenly balanced and accurate tonal curve. QSC's proprietary Intrinsic Correction(tm), first introduced with the WideLine(tm) Series, actively adjusts time, frequency and amplitude response to achieve a maximally flat bandpass target. The KLA Series brings the power and sophistication of a line array system into an easy-to-use product significantly redefining the line array product category. With its simple Lift, Click and Play approach, KLA can be deployed in a fraction of the time required by comparable line array products. This fixed arcuate, active line array system is ideal for a wide range of portable and permanently installed applications ranging from live entertainment to houses of worship or other venues where a line array system is desired. The KLA Series is comprised of two models, the KLA12 12-inch, 2-way loudspeaker and the KLA181 18-inch subwoofer. 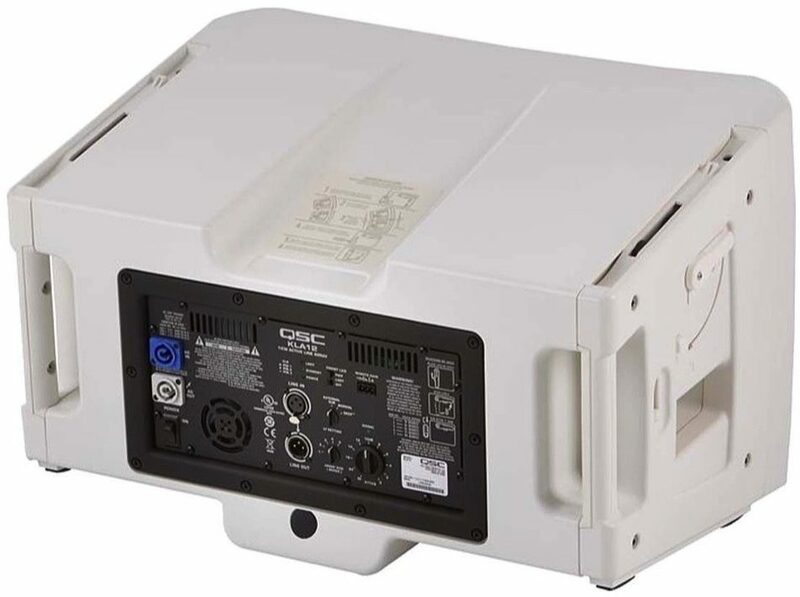 The KLA12 features a highly efficient 500 watt by 500 watt power amp. KLA12 Power Module module and the KLA181 offers the same highly efficient power amp module in a 1,000 watt configuration. This efficient design enables up to five KLA models (any combination of KLA12 and KLA181) to be driven off of a single 15 amp, 120 volt electrical circuit. KLA loudspeakers incorporate QSC's DEEP(tm) DSP algorithm - providing extended bass response by actively managing potentially damaging low-frequency transients - and GuardRail(tm) circuitry protection which prevents the amplifier module from unnatural and destructive clipping. As an energy saving feature, the Auto Standby mode automatically engages after five minutes of inactivity but upon resumption of audio signal, the power module on the KLA will awaken instantly for immediate output. In an installed application, multiple KLA Series loudspeakers can be "daisy-chained" for total gain control from a single remote pot wired to the on-board Phoenix-style connector. Additional power module characteristics on KLA include a balanced, line-level XLR input in parallel with an XLR "Thru" connector, PowerCon(tm) In and Thru connectors, Attenuation Control and LED indicators for Signal, Limit, Power and Standby status. "Simply Amazing and No Fuss Setup"
45 of 47 people (95.74%) found this review helpful. Did you? 27 of 29 people (93.1%) found this review helpful. Did you?